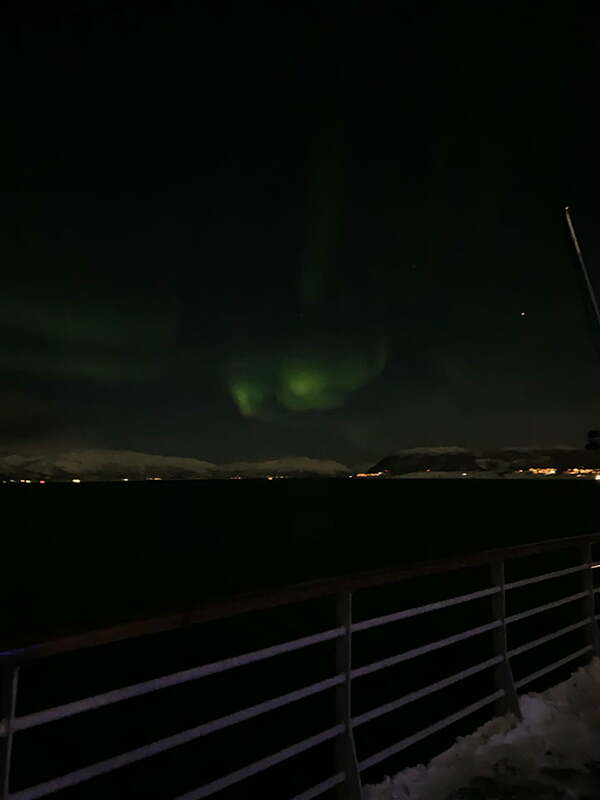 Home › Cruises › Day 8: Hammerfest & Northern Lights! 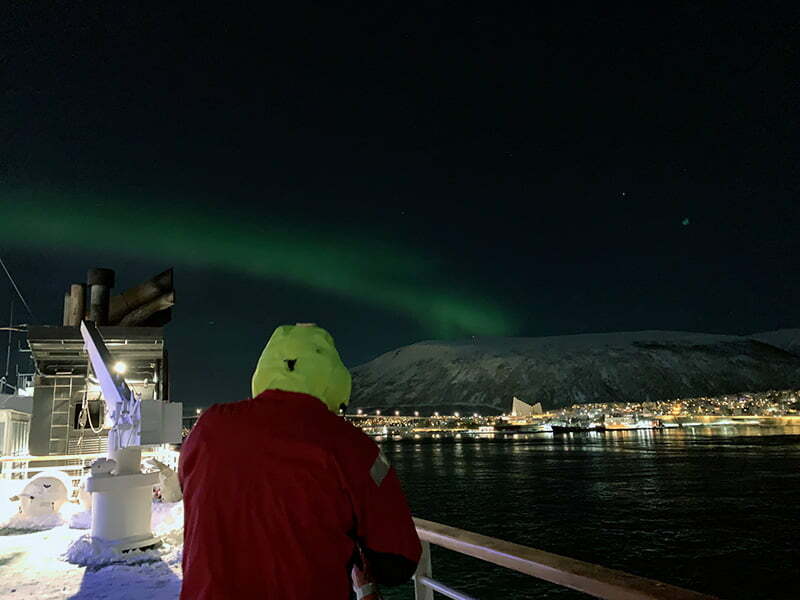 Hurtigruten Diary Day 8: Blizzards on the deck, Hammerfest in the snow, and northern lights in Tromsø. One thing I've noticed today is the number of people suffering from colds. I guess it's almost inevitable on a ship although everyone I've seen is using the hand gel when they come in and out of the restaurant. So far I've avoided picking up any bugs, but writing that has probably cursed me. Watch this space! I know at least one reader of this diary is on board the Nordlys, so I went up to wave and take a photo. Hello to you! Once again the light this morning was fantastic but only three other people were up on deck to enjoy it. It's such a shame! 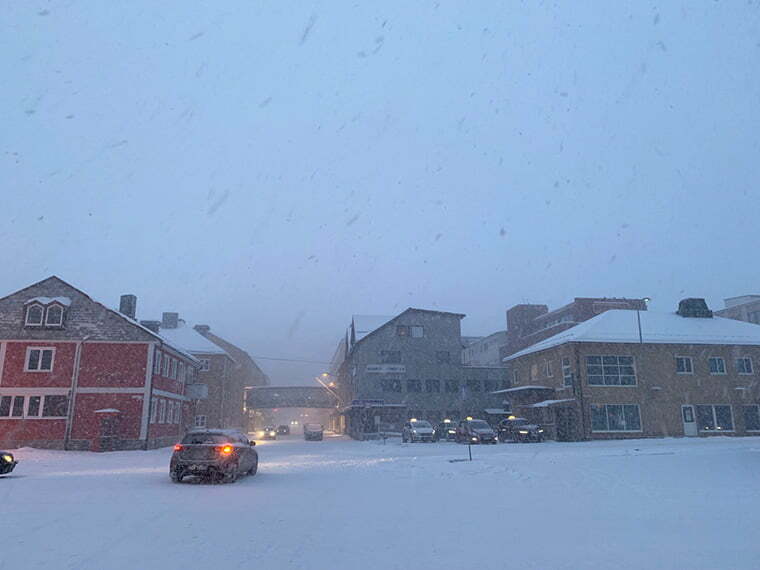 As we travelled towards Hammerfest, the weather took a turn for the worse and it began to snow heavily. 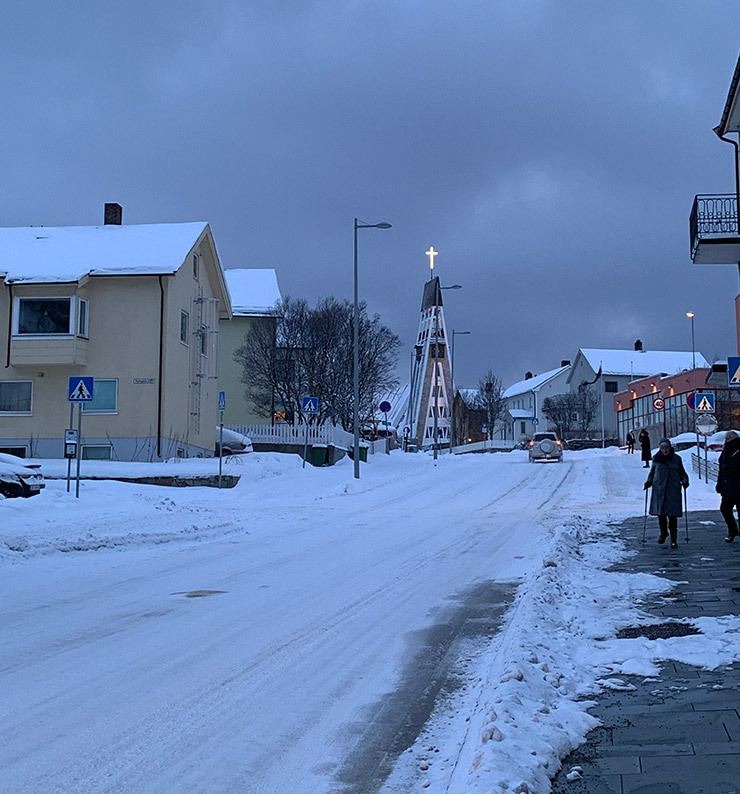 Having seen Hammerfest in ridiculous 30C/86F heat a few summers ago, I was keen to see the town in the winter. I put my tour guide hat on and took a friend from the ship to see two of the city's churches and a general wander. It was an opportunity to spend some quality time in a port while it was light, something that hasn't happened too often so far. 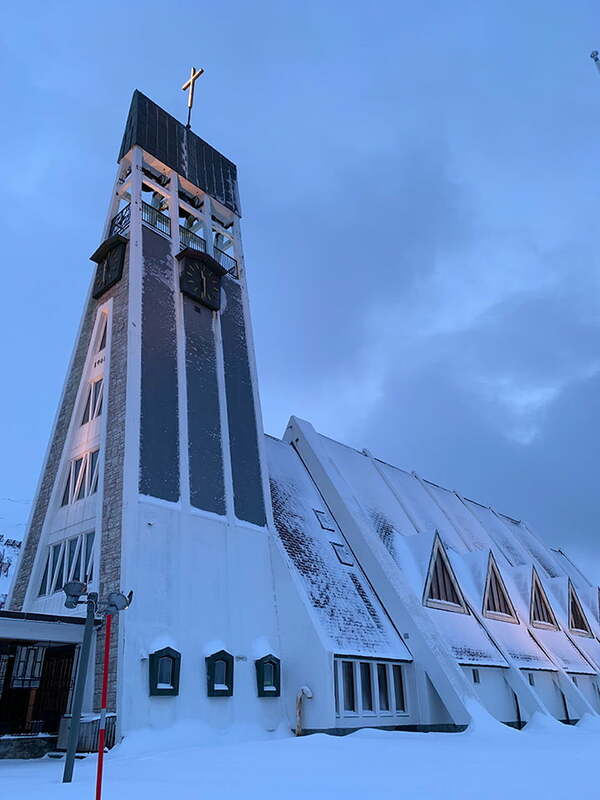 I love the modernist architecture of the Church of Norway's Hammerfest Church. The lit cross made a big impact against the dull grey sky. We also had time for a quick look inside the Catholic church, a stroll around the marina, and a wander around the free exhibition of polar exploration history inside the tourist information office. And then came the snow! 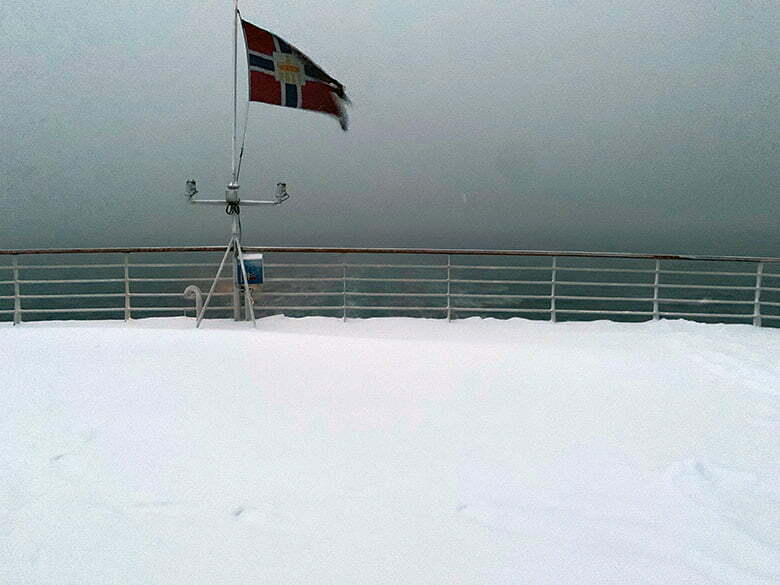 After a well-earned lunch I noticed it was still snowing, and thought about heading up on deck to take a look. As soon as I heard an announcement advising extreme care when going out on deck, I knew had to get up there. I've turned up the brightness full blast on this shot so you can see how much snow there was on deck, and how poor the visibility was. In reality it was much darker than this, and kinda spooky to be honest. Two minutes later, and I was back down in the cafe clutching a warm cuppa. 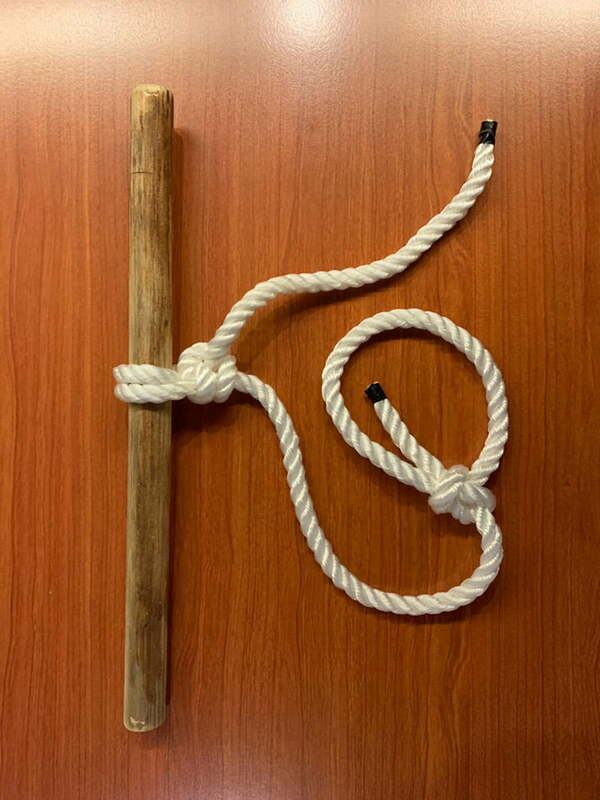 During the afternoon a session was run in the panorama lounge on tying knots and hitches. I expected a demonstration, but the crew handed out leaflets with instructions and off we went! Three of the deck hands wandered around to help and guide. One of them in particular was super helpful and spent quality time with people who were struggling. It was nice to see someone obviously enjoy their work so much and wanting to share it with others. 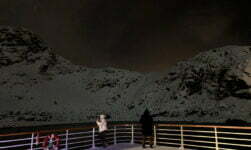 As we set sail from Hammerfest in a blizzard the chances of seeing the lights during the long evening seemed unlikely. 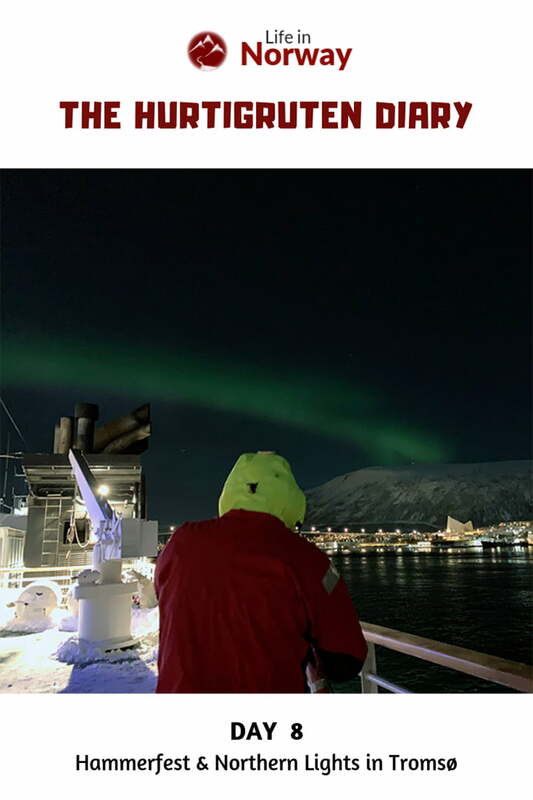 The great thing about the northern lights hunt is that you never know. 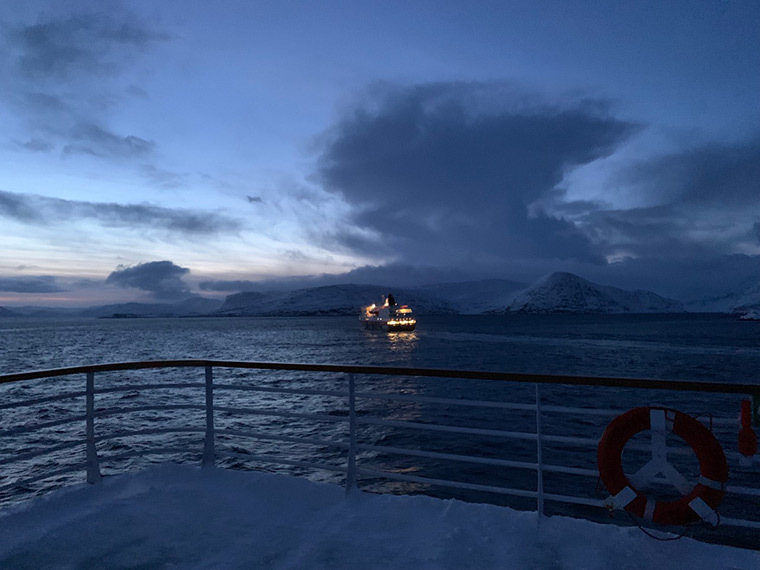 We were due to get a talk from the captain in the Vesterålen lounge but a problem with the AV system on board meant it had to be postponed. Hopefully this will go ahead tomorrow. 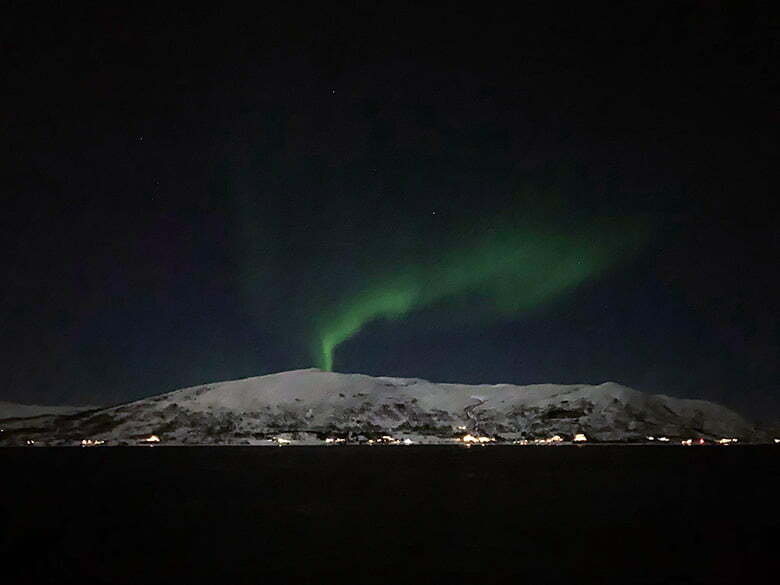 Finally after a vague sighting over the Trollfjord and several days of disappointment because of cloudy and stormy skies, the aurora came out for a dance as we approached Tromsø. When the call was made a little after 10pm the light was extremely vague and there was a definite sense of disappointment among the 40 or so people who came out on deck. The sky was clearing very quickly though, so many of us stayed. Within ten minutes, stars were visible and the clouds seemed to part. Those of us who braved the chill (-6C but -13C with wind chill) even longer were treated to a more intense show from 10.45 to 11.15pm. While still not spectacular, it was a much more vivid display with good colour, movement and at one point activity in every direction. An interesting note on photography: I was struggling with my DSLR as it was so cold, but the photos on this page were taken with my iPhone XS. A couple of years ago smartphones could not capture the lights, so I was incredibly surprised at how well they turned out. They're obviously a long way from professional standard, but I am thrilled that a point-and-shoot camera gave me the memories I wanted, while giving me the time to look and absorb everything with my own eyes. That said, a few people with tripods and patience managed to take truly sensational pictures. The icing on the cake! 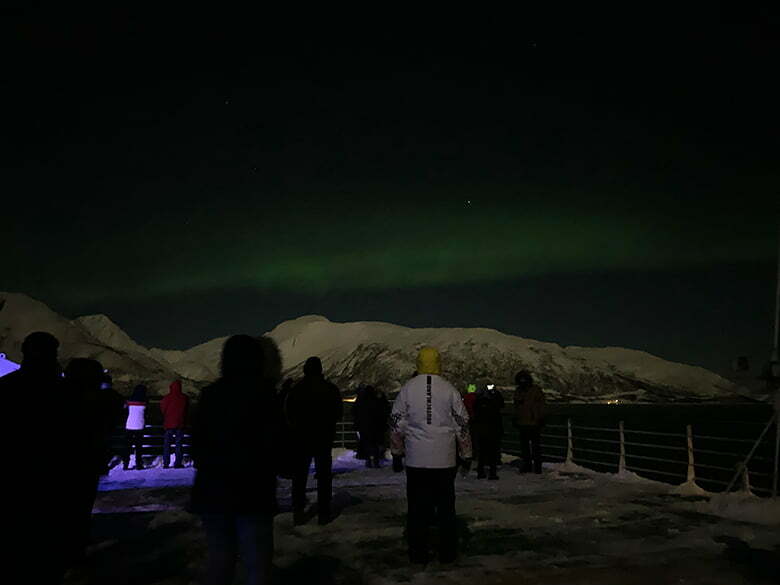 About 15 minutes after we docked and the buses had left the ship for the midnight concert at the Arctic Cathedral, the skies above Tromsø exploded with green. I was too late to capture them at their best, which was an inverted pyramid that seemed to begin from the Arctic Cathedral itself. The best I could do was the photo at the very top of this post. Sorry about that! But still, it was a truly inspiring sight with which to end the day. 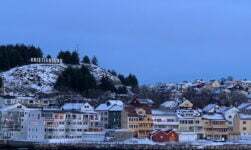 Tomorrow I'm off for a morning tour of the Vesterålen islands, somewhere I've driven through before and am very much looking forward to a return visit. I really liked your comments. I live in Brisbane Australia and the temperatures are in the mid 30. Fabulous David, so jealous! 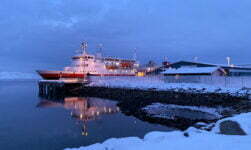 I live in Cyprus and my neighbours who have a holiday home here live in Tromso. 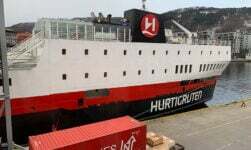 A cruise with Hurtigurten lines is on my bucket list. I did a cruise with an Italian line🙄 April 2017 so definitely want to go back to Norway for a winter experience. Super blog, thanks so much. 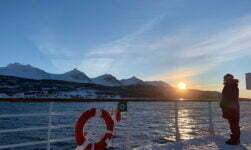 I drove from Kirkenis to Bodø last June. 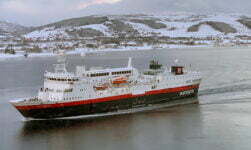 I am inmensly enjoying your Hurtigruten diary. Tusen takk!